The top performer small growth stock mutual funds 2012 are Buffalo Micro Cap fund, ASTON Small Cap Growth fund, PNC Small Cap etc. 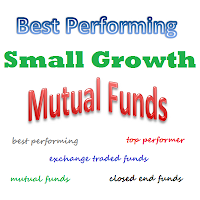 Small growth mutual fund invests mainly in fast growing small company in United States. The market capitalization is usually lower than $300 million. The fund favors companies in up and coming fields or young corporates on their early growth stages. These small cap stock mutual funds are typically very volatile than large cap stock mutual funds. They do provide higher chances for capital growth as well. 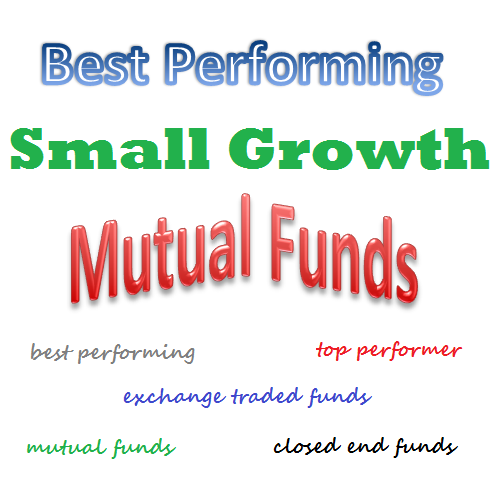 These top performer small growth mutual funds are sorted based on its performance in 2012. You can find the fund review information such as expense ratio, turnover rate, yield, performance, management, etc. Buffalo Micro Cap fund uses its assets to in domestic common stocks, preferred stocks, convertible securities, warrants and rights of micro capitalization companies. This equity fund is managed by John Bichelmeyer and Grant P. Sarris. It has 1.51% annual expense ratio. The shares price of this BUFOX is $11.89. This top performer small growth mutual fund has small total net assets of $62.32 million. It has 4-stars rating from Morningstar. There is no dividend yield. Based on the load adjusted return, the fund has returned 2.59% over the past 5-year and 29.97% over the past 1-year. As of June 2012, the top ten holdings are Align Technology Inc (3.64%), Market Axesss Holdings Inc (3.49%), Chart Industries Inc (3.31%), Guidewire Software Inc (2.92%), Stratasys (2.91%), Cornerstone OnDemand Inc (2.86%), Thermon Group Holdings Inc (2.69%), SciQuest Inc (2.44%), SPS Commerce Inc (2.37%) and Internap Network Series (2.24%). ASTON Small Cap Growth fund objective is to achieve long term capital growth. It has total net assets of $6.41 million. It invests in growth stocks of small-cap companies. It also has expense ratio of 1.35% per year. There is 0.25% 12b1 fee for investing in this domestic stock fund, but no front-end sales load fee. As a new fund, there is no Morningstar rating yet. The year-to-date return is 17.49%. As of 2012 third quarter report, the top 5 stock holdings are Health Management Associates Inc (4.93%), Kenexa Corp (4.68%), The Geo Group Inc (4.45%), Triumph Group Inc (4.22%) and Vanguard Health Systems Inc (3.35%). The top sectors are Information Technology (26.65%) and Health Care (23.55%). Federated Kaufmann Small Cap fund is managed by Hans Utsch since 2002. This mutual fund focuses its assets in the common stocks of small companies that are traded on national security exchanges, the NASDAQ stock market and on the over-the-counter market. It has $760.09 million of total net assets. The expense ratio is 1.95% per year. This expense fee is higher than the average ratio in the Small Growth category (1.47%). Russell 2000 Growth is used as its benchmark. Morningstar rated this top performer small growth mutual f und with 2-stars rating. Since its inception in 2002, this FKASX fund has achieved a total of 7 years of positive return. Its best 1-year total return was recorded in 2003 with 81.61%. It has YTD return of 20.98%. In the last bull market (September 29, 2011 to April 29, 2012), this fund has returned 40.10%. The top holdings as of October 2012 are Dynavax Technologies Corp (7.7%) Commvault Systems Inc (2.6%), Cubist Pharmaceutials Inc (2.4%), International Meal Co Holdings SA (2.1%) and Arezzo Industria e Comercio SA (2.0%). PNC Small Cap Fund aim is to provide capital appreciation. It utilizes its assets to buy portfolio of stocks of U.S. small cap companies with stock market capitalizations between $100 million and $3 billion. The total net assets are $157.21 million. The 3-year beta risk is 1.12. The fund’s NAV is $14.08 (12/2/2012). Morningstar rated this top performer small growth mutual fund with 3-stars rating. It has 1.45% 12-month ratio. It has YTD return of 16.72% and 5-year annualized return of 1.74%. The only year it has negative return since its inception was in 2008 with -37.26%. The best 1-year total return was 28.15%. As of September 2012, the top holdings are OSI Systems Inc (4.53%), Portfolio Recovery Associates Inc (4.13%), Bank of the Ozraks Inc (3.66%) and Virtus Investment Partners Inc (3.43%). The top sectors are Industrials (24.58%) and Financials (21.53%). Wasatch Micro Cap Value Fund invest majority of assets in equity securities of micro cap companies with market capitalizations of less than $1 billion. Brian A. Bythrow is the current assets manager. He has managed it since its inception in July 2003. It has total net assets of $135.35 million. The yearly expense ratio (2.25%) is quite higher than the category average which is only 1.47%. There is no management fee and no sales load fee. This small growth mutual fund has 3-stars rating from Morningstar. Based on the load adjusted return, the fund has returned 0.67% over the past 5-year and 11.50% over the past 3-year. As of September 2012, the top holdings of this top performer small growth fund are Virtus Investment Partners Inc (2.09%), BofI Holdings Inc (2.05%), Colony Financials Inc (2.01%), First Cash Financial Services Inc (2.00%) and NorthStar Realty Finance Corp (1.82%).